“Wright’s Lessons” was composed between June and December 1995 for NEXUS, string quartet, narrator and the Toronto Children’s Chorus under the direction of Jean Ashworth-Bartle. The text is directly taken from a reader for children written by Albert D. Wright and published in 1846 entitled, “Wright’s Primary Lessons “. Essentially, Wright’s idea was to present the alphabet by the sound (or power, as Wright called it) of each letter, rather than by the letter’s name, as is done in the alphabet song, for example. Wright presented one letter at a time in each lesson, and by quickly forming words and constructing sentences, the lessons render a simple and direct kind of poetry, eventually leading to full reading lessons of original miniature stories and poems. The music is divided into three sections. The first includes the introduction of vowel sounds and consonant sounds along with simple sentences that immediately follow. The second section deals with completing the process of learning all of the letters of the alphabet by their sounds. In the third section two short stories comprised of one-syllable words are read, followed by an introduction to words having more than one syllable. After the recitation of an untitled poem about springtime (childhood? ), the lessons conclude with a moral – the Golden Rule. “Gahu” is a popular recreational dance that has travelled with the Ewe people on their migrations from northern Nigeria through Togo and Dahomey into southeast Ghana. The music is played on the standard family of Ewe Drums – the high voiced Kagan, the medium Kidi, the bass Sogo, and the leader or ‘master drum’, Atsimevu. Completing the ensemble are the iron bell Gankogui and the gourd rattle Axatse. The drum ensemble music of Ghana is renowned for the intricate complexity of its cross-rhythms and for the musical ‘call and response’ which gives the performance the quality of a group conversation. With Voice and Drum touches multi national “chords”; Africa, England, France, Canada. and the United States. Nexus’ renowned skill for improvisation provides a mesmerizing overture to one of the finest contemporary vocal works, R. Murray Schafer’s Epitaph for Moonlight. Nexus’ arrangement of Fra-Fra, a traditional Ghanaian drumming piece, is a spectacular display of power and ensemble playing, and Kesselman’s Shona Mass concludes the first half on an exuberantly joyful note. The second half comprises songs associated with military history; at times stirring, poignant and humorous, but always satisfying; each a small masterpiece of classical, folk and theater music. Nexus accompanies these songs with their replicas of 18th century rope tensioned field drums. They also perform a rousing suite of historic military drum beats and their rendering of Yankee Doodle is a sure crowd pleaser. The program requires an organ, pipe or portative, and a choir of at least twenty voices. It provides plenty of room for each choir director to customize repertoire to his or her choral needs. 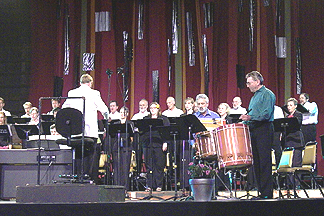 Although the program is of good concert length, about one hour forty – five minutes with intermission, it can easily be expanded or reduced as required. 1. Simple Gifts – Elder Joseph Brackett (1848) – arr. R.E. 2. I’ll Beat My Drum as I March Along – Sister Jane Sutton (mid 19th C.) – arr. R.E. Yankee Doodle – (Steele New & Complete Preceptor for the German Flute, 1815) – arr. R.E. Lyrics: Andrew Barton, (1767) The Columbian Songster (1799) Thomas Skillern, London (1778). Pretty Girl Milking the Cow – Traditional. – arr. R.E. Chester – William Billings (1778) – arr. R.E. The Drummer Boy of Shiloh – William Shakespeare Hays (1862) – arr. R.E. 2. The Morning Trumpet – B. F. White (1874) – arr. R.E. Rule, Britannia! – Dr. Thomas A. Arne (1741) – arr. R.E.